Camp Deep Pond is specifically designed to enrich the lives of inner-city youth by introducing them to an exciting outdoor world of adventures and challenging activities designed to promote self-worth, character development and teamwork. Boys & Girls Clubs of Northeast Florida brings thousands of children and teens to Camp Deep Pond every year to experience outdoor education in a true camp setting. Most of our campers are at-risk inner-city youth, many from single-parent households, that have never experienced camping, fishing, swimming in a lake and team-building activities. Thank you for making Camp Deep Pond a reality. Here are some of the milestones we’ve achieved together. 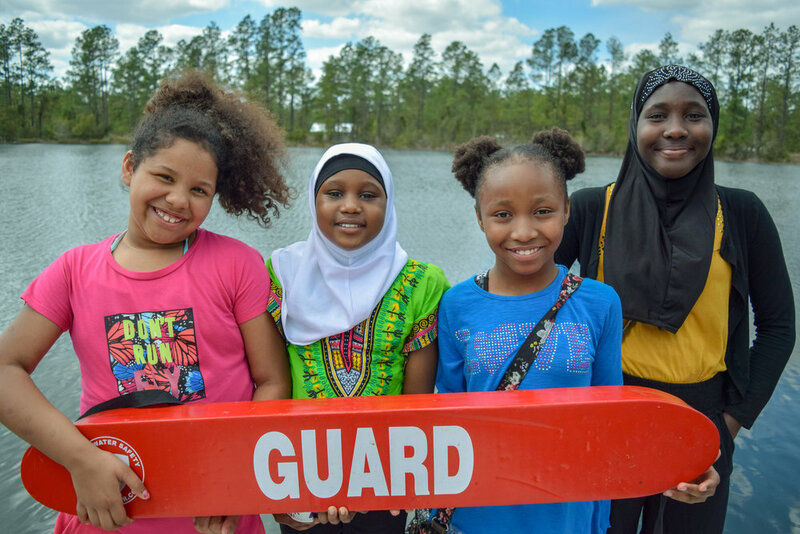 For 2019, we’re sending all our Boys & Girls Clubs of Northeast Florida Summer Academy and Summer Sail members to Camp Deep Pond for a 2-day camp experience. Our goal is to provide thousands of children and teens a real, outdoor summer camp experience at Camp Deep Pond. Our inner-city youth will be introduced to a natural camp setting, water sports, archery, camp fires, fishing, rockets and art activities. In 2019, Camp Deep Pond will host thousands of youth from across Florida during the summer and into the school year. Campers will learn about nature and conservation through Ultimate Journey and Project Wild curriculum. These excellent programs are provided by the Florida Youth Network/Florida Fish and Wildlife Conservation Commission and Boys & Girls Clubs of America. Campers will hit their mark with the help of our USA Archery – certified instructors. Our expert staff will teach campers how to ride bicycles, paddle kayaks, swim in the lake, build and launch model rockets and roast marshmallows. Camp Deep Pond is a great place for youth to sing, laugh and play with their friends while making memories that will last a lifetime. Our staff is currently researching best practices for day camps. We are examining startup costs, operating expenses, and additional revenue streams. We believe we can make the summer camp project sustainable long-term if we partner with organizations to use the property during the off-season. If you are interested in scheduling a preview of the property, please contact Thomas Stinson, Camp Director of Boys & Girls Clubs of Northeast Florida at 904-396-4435 or thomass@bgcnf.org. Camp Deep Pond is located at: 281416 Sundberg Road, Hilliard, FL 32046.